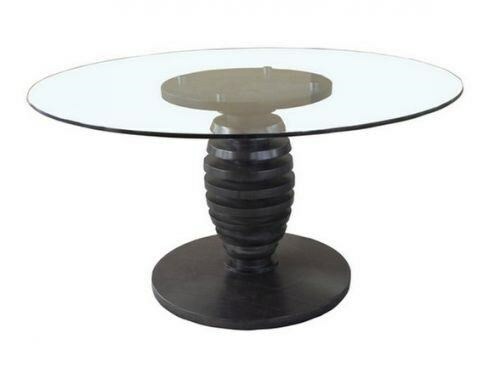 Welcome family and friends into a stylish dining space with this round dining table. The table pedestal is crafted from eco-friendly solid BambooTimbre, with a cutout design that resembles a pinecone for a striking focal point. The table is available in multiple finishes, so that you can find the perfect tone for your style and dining area. A glass top finishes off the piece, providing a sleek, easy-to-clean surface. The Metro 60" Dining Table by Maria Yee at C. S. Wo & Sons Hawaii in the Hawaii, Honolulu, Oahu, Hawaiian Islands, Waikiki, Diamond Head, East Honolulu area. Product availability may vary. Contact us for the most current availability on this product.